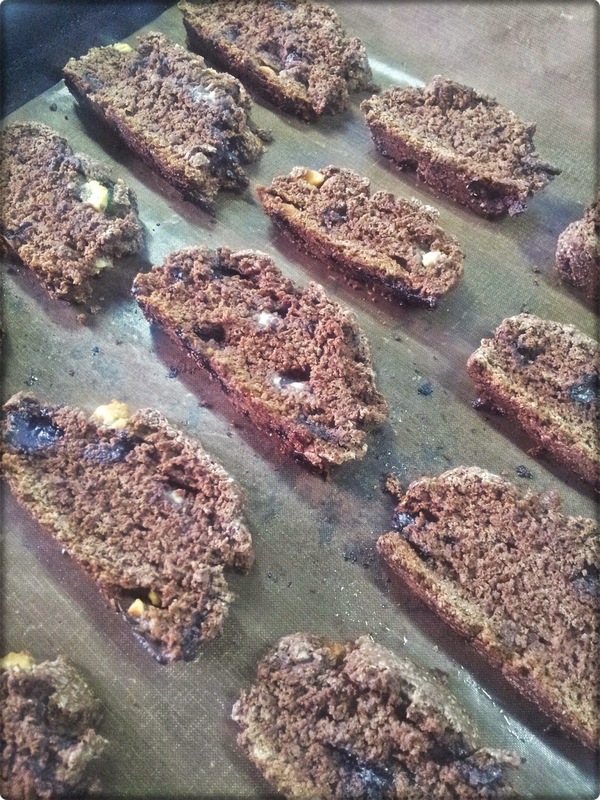 I first made these lovely crisp biscotti, which go perfectly with a cuppa, with raisins and dark chocolate chips using a brilliant recipe from the Hairy Dieters as inspiration when on the hunt for lower fat/calorie bakes that still delivered a sweet hit. 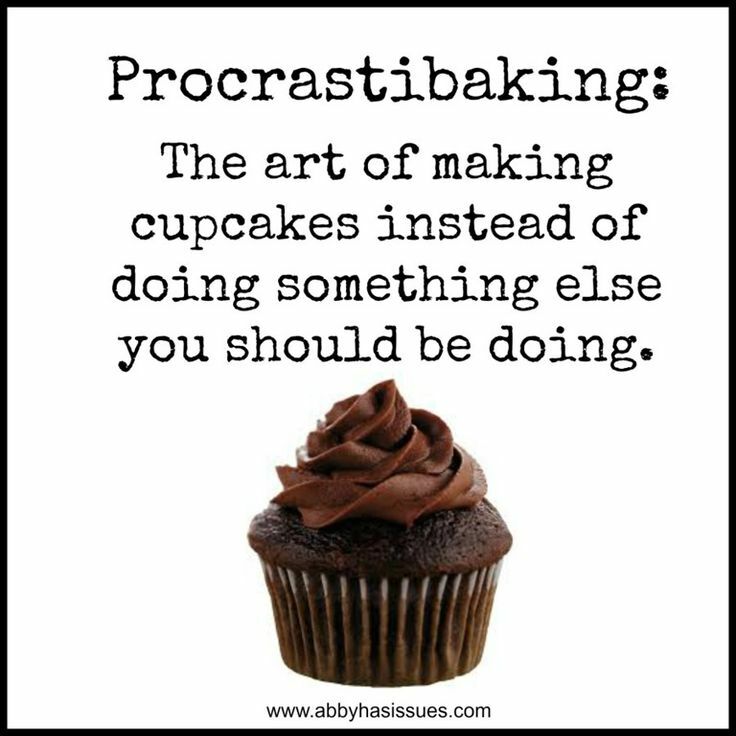 They turned out fantastically and have since become a bit of a signature bake of mine. I love how easy and versatile this recipe is – once you’ve got the basic biscotti dough you can add pretty much anything you want for flavour: chocolate, spices, citrus zest, dried fruit, nuts…the list is endless! The original version made with orange zest, dark chocolate chips and dried cranberries weighed in at only 53 calories a piece so, although I can’t give an exact estimate when other ingredients are added, the chances are they’re still reasonably sin-free provided you don’t go too mad with the sugary extras! 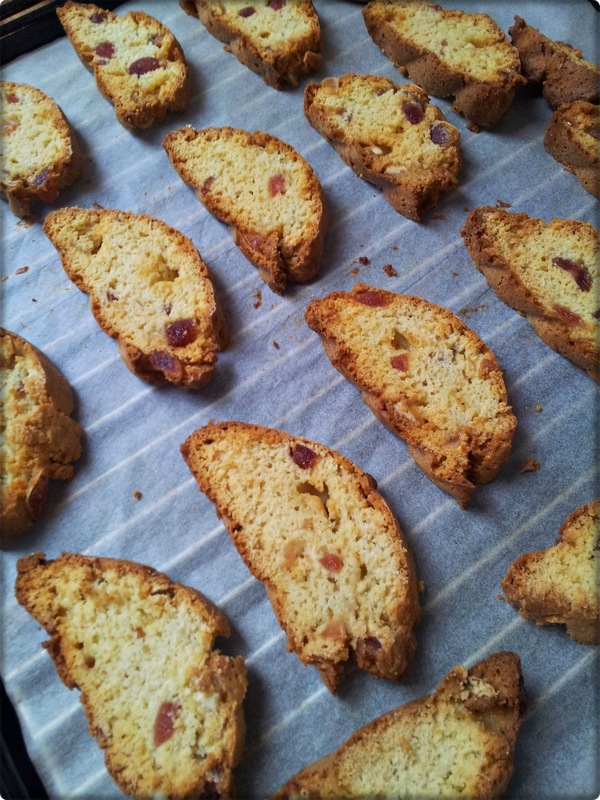 I know traditionally biscotti is made with almonds but I always use almond extract as I love the delicate flavour it gives. By all means use flaked almonds if you prefer though. Pre-heat the oven to 180 degrees C (or 160 fan) and line a large flat baking tray with parchment paper. Mix the dry ingredients together in a large bowl then add the chocolate chips, cherry pieces and almond extract. Beat the egg and egg white together along with the vanilla extract for around 1 minute and pour into the mixture. Mix with a wooden spoon and then your hands until the ingredients come together to form a stiff dough. If it’s too sticky add a little more flour and if it’s too dry and crumbly add a splash of milk. Roll the dough into a sausage shape about 25-30cm long and place on the baking tray then gently flatten it until it’s about 2cm tall. Place in the oven for around 25-30 minutes until the dough is firm with a crust but still fairly pale. Remove from the oven and reduce the heat to 140 degrees C then allow the dough to cool for around 10 minutes before sawing into pieces about 2cm thick using a serrated knife. Place the biscuits back on the baking tray and cook for a further 25 minutes or until lightly browned then leave to cool before enjoying with tea or coffee. Biscotti is LOVE! Dark chocolate is double LOVE! !